For their second album, this Italian group has expanded on its dramatic, heavy-metal-meets-neoprog sound. A quartet of guitars, keys, vocals, and drums, their music flirts with a quasi-operatic quality that often has the aura of an over-the-top rock musical. This element is brought to the forefront on Black Opera, with an 18 minute "tribute" to Verdi forming the centerpiece of the album. 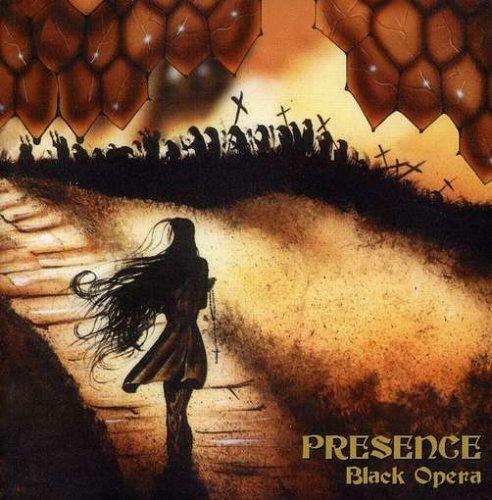 Black Opera is a rather fitting title, as they take excerpts from Verdi operas, pull out the melodies and harmonic progressions, and place them into their own heavy neo-prog musical settings. Vocalist Sofia Baccini has a voice equal to the task, but the humor of this misfit juxtaposition is not obscured by her performance. The rest of the album features a half-dozen six to eight minute tracks, sung in English, that focus a bit more on the heavy metal aspect of their sound, though never losing the neo-prog sensibility. Digital synth pads provide a harmonic backdrop for some flashy speed guitar solos in the metal idiom, as driving rhythms are pounded out by an insistent double kick drum and crunchy guitar riffing. Sofia's vocals soar and occasionally growl, and help give the music a genuine sincerity without which Black Opera would be reduced to a parody of pretension. If dramatic, metalish neo-prog is your bag, by all means check this out. Giuseppe Verdi, 1813-1901. Not exactly a household name among proggers, but his operas rank among some of the best of the 19th century: La Traviata, Aida, Don Carlo, Rigoletto, and others. He's been pretty much ignored by rock bands thus far, so what more fitting then, than a rock tribute to his work? "A Giuseppe Verdi," the centerpiece of this second album by Presence, is exactly that — an 18-minute suite containing rock adaptations of four pieces taken from Verdi operas. Vocalist Sofia Baccini has no trouble pulling it off, her voice is powerful and emotional, and she seems quite comfortable in a variety of styles; yet this probably won't be enough to change the minds of those with a bias against opera to begin with, as Presence — despite arranging the material for rock instrumentation — stick fairly close to the spirit of the originals. Hopefully some will be more open minded. The band proper consists of Baccini, keyboardist Enrico Iglio and guitarist Sergio Casamassima. The rest are all guests, unlike the first album, The Sleeper Awakes, which seemed to be a full five-piece band. On the remaining tracks, their style clearly leans toward the prog-metal zone, albeit darker and more sinister than most, with Baccini's voice being the unlikely twist in the mix: her style often recalls Sonja Kristina of Curved Air, elegantly propelling the material forward with a vengeance. Drums are supplied by two studio musicians, and herein lies the album's main weakness: with the notable exceptions of the Verdi piece, "On Travel," and "Just Before the Rain," the drummers tend to fall into the rut of simple boom-bash 4/4 timekeeping mode, made irritatingly worse by being too far up in the mix. With a better drummer this band could be awesome, there is certainly more to like about them than dislike.